Fishbowl, building blocks, swings and square shaped goldfish. In Ken Tsoi’s world, these are symbolic to the city dweller’s way of life in Hong Kong, representing the various characteristics that we should or should not have, and may or may not like. This solo exhibition, Stubborn Happish, is inspired by Zhuang Zi – the Chinese philosopher whose theory is that no one should tell you how to be happy, or how to live your life. Square shaped goldfish appear in several paintings, seemingly the link between the artist and his work. He combines his favorite fried fish cakes (square shaped of course) with comical goldfish, which also resonates with his interest in comics. Ken wanted to portray that every person is different and that there is in fact nothing wrong with that – hence the fish could appear to be an oddity in our (or its) world, but it is comfortable in its own skin. Choosing watercolor, ink and markers as mediums, Ken visually describes his strong ideas in very soft flows, concurrently giving fine details to add to the depth of his subject. He seeks to provide just sufficient information to ensure his messages are whispered, not yelled. “Non Boundary Happy” was Ken’s first painting in this series. At first glance, the story seemed to be of a man that is constrained, trying to break out of his boundaries. Closer inspection reveals that it is quite the exact opposite! 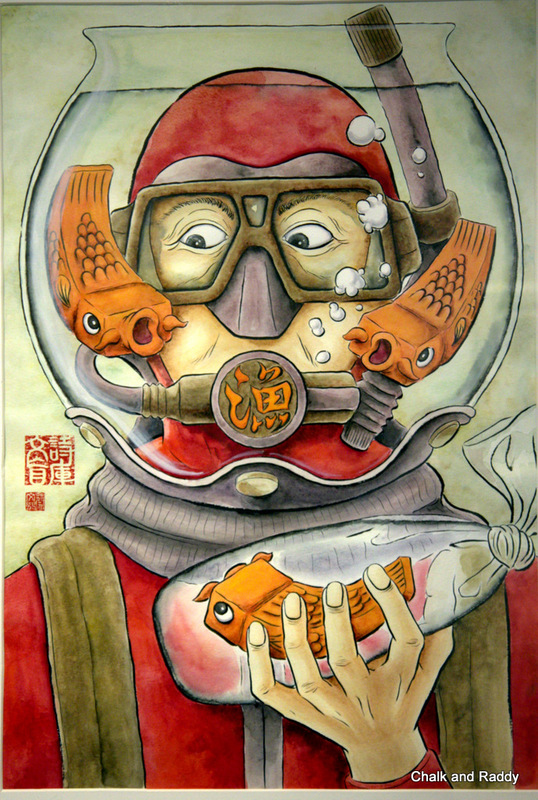 In Ken’s mind, this man portrays positive action – someone who is not able to dive the open sea and so creates his own diving adventure in this fishbowl instead. Putting this into the Hong Kong context, the picture really sends out a clear message – find your own happiness and create your own adventures just like how this man is doing what he likes, within his own means. In one painting, a contented looking man relaxingly soaks in a bathtub. The backdrop seems to be a bathroom and living room all rolled into one. Parquet tiles, which are most commonly used for living room flooring are matched with bathroom wall tiles, and a bowl of fruits sits atop the covered toilet seat. Odd? Well, in Hong Kong where 300 square foot apartments are common, the only oddity about this picture is the unhygienic placing of food on the toilet seat! However the reality of it is that, in small living spaces, people still need to find the ability to wind down, enjoy themselves and stay positive in order to be happy. Ken worries about city dwellers’ negative energy, which he deemed a result of society’s constant quest for success, measured by monetary value. He hopes to encourage positive thinking and believes that we all need to rediscover our childhood’s innocence and courage, in order to live a fulfilling life. Childhood – shows a man diving down with his legs on the swing, facing his fear – which ironically only crept up when he was an adult. We are reminded to sometimes re-live our younger days and recall how simple things used to be. To just simply be – as happy as a child, dance like a child, sing like one, run around like you had no worries at all! This, for Ken, is the meaning of positive energy and letting ourselves go once in a while. Being a true blue Hong Konger, Ken has dreams for his city and people. He would love to see the Hong Kong culture reignite, the cultural roots of what was once a country on its own reprise. He would love to see the young(er) generation cultivate the local culture while moving forward in a globalised, modern world. Materialism should not be the culture of Hong Kong. People should not be bounded by money as money is not the source of happiness. While it is important and nice to have, having an abundance of monetary wealth is pointless if you are unable to find happiness within yourself first. And to find happiness, you need remember how it felt like to be free, pure and innocent – like how you once were, a child with no boundaries. 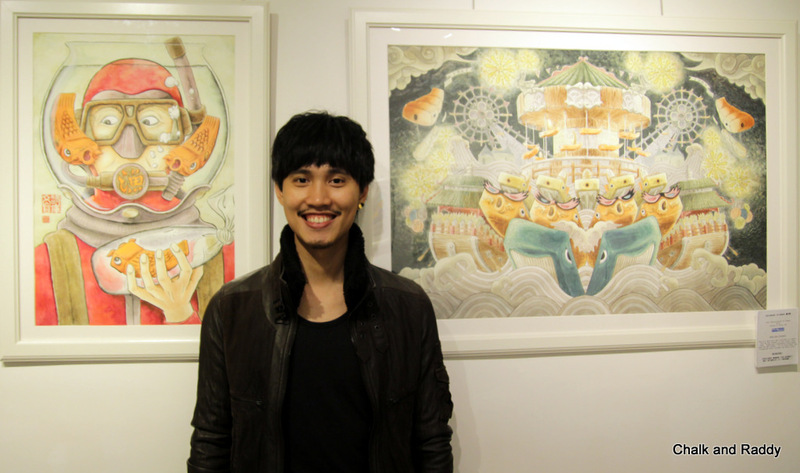 Join Ken at PubArt Gallery’s “Know Your Artist”session on Saturday, 02 March between 4pm-6pm. Posted on February 26, 2013 by ChalkandRaddyPosted in Visual ArtTagged Emerging Art Hong Kong, Hong Kong Art, Ken Tsoi, Stubborn Happish. Previous Previous post: Long Live Markets!